Up until a few months ago I was trading an asset allocation strategy that invested significantly in bonds and large cap US stocks. 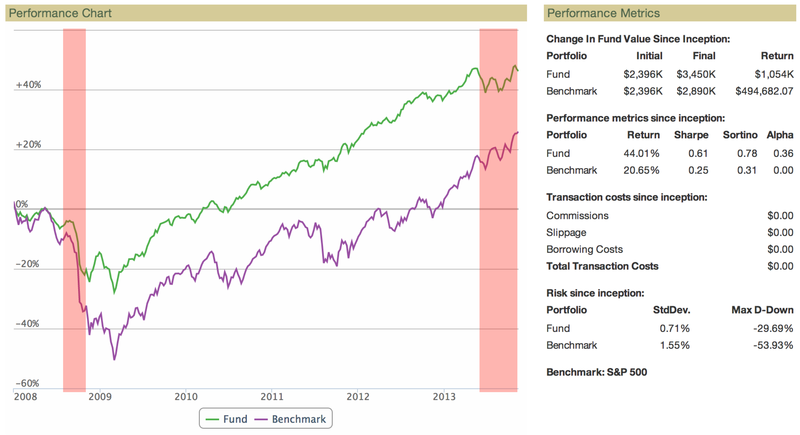 I exited that strategy because the correlation between bond and stock returns concerned me. Here’s a detailed analysis. Back test of a simple 50% bond, 50% large cap stock strategy. Rebalanced monthly. Green: Strategy, Purple: SP500. If your investments are managed by a wealth manager you likely hold a diversified portfolio that is designed to reduce risk. If your manager is good, he or she probably uses some sort of asset allocation or risk parity method for deciding how much should be invested in each asset. This simple asset allocation strategy traded since 2008 would have provided twice the return of the market and half the volatility since 2008. 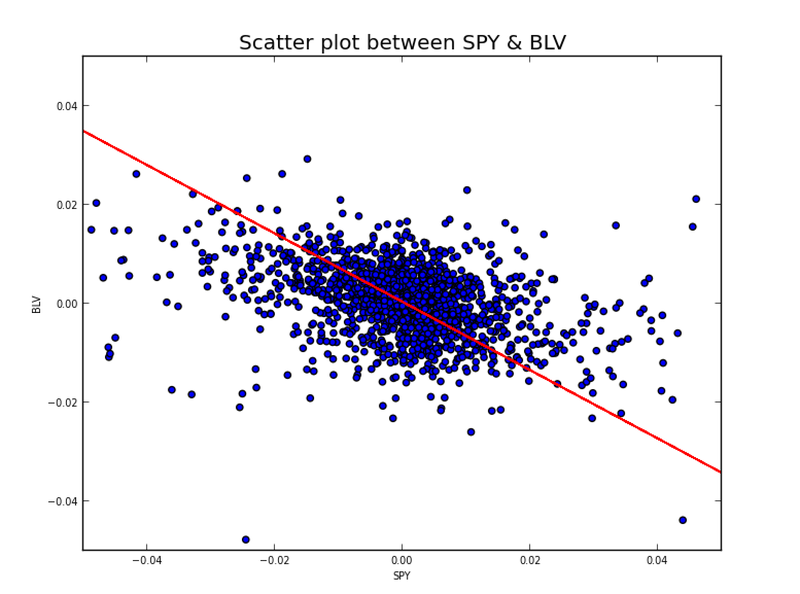 Scatter plot showing daily returns of SPY versus BLV. They are negatively (or anti-) correlated. This is good! The not-so-well-kept secret that explains why strategies like this work is anti-correlated return. In particular, while the cumulative returns of bonds and stocks are both positive over recent months and years, their daily returns frequently move in the opposite direction. The reason this is important is that on those days one asset has a bad day (the market drops) the other is likely to move up to soften the blow. We can measure this behavior quantitatively using a scatter plot (see figure at right). Each dot in this chart represents the one-day return for each ETF. For instance, if SPY goes up 1% and BLV goes down 0.5%, a dot located at (0.010, -0.005) is added to the chart. There are several hundred data points in this chart representing the days since 2008. When we fit a line to this data (red) you can see that the two securities have anti-correlated daily returns because the slope of the line is negative. 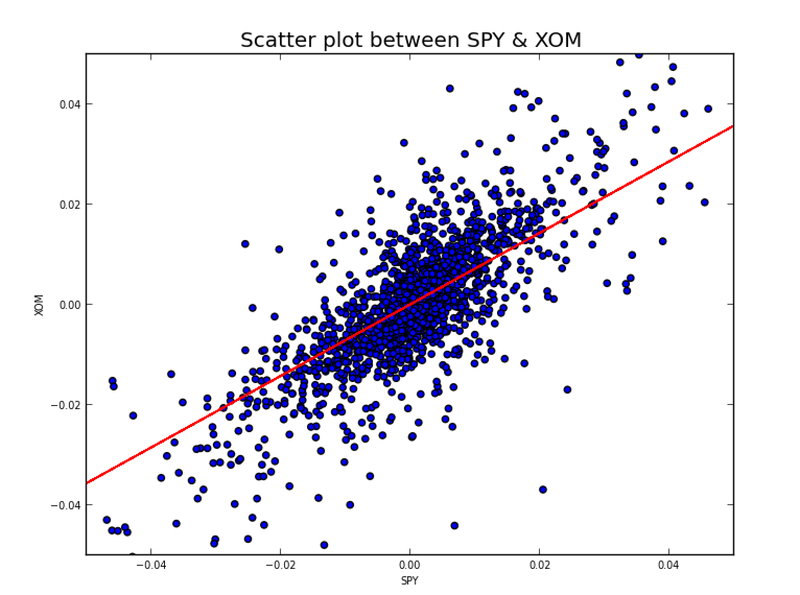 Scatter plot illustrating the relationship between the daily returns of XOM and SPY. They are positively correlated. This is bad. The property of assets that move in opposite directions in the short term is an important one for stable portfolios, especially in turbulent markets. You are probably familiar with the mantra “diversify.” Anti-correlation is a key side effect and goal for diversified portfolios. The challenge for the portfolio manager is to find assets that are at least uncorrelated and preferably anti-correlated in the short term while simultaneously accruing value in the long term. Just for comparison, I include a similar scatter plot of SPY versus XOM (Exxon Mobil). These two securities have positively correlated return. Combining them together into a portfolio would not provide useful diversification benefits. Many asset allocation strategies began to falter in May and June 2013 and their performance has been volatile and sub par since that time. 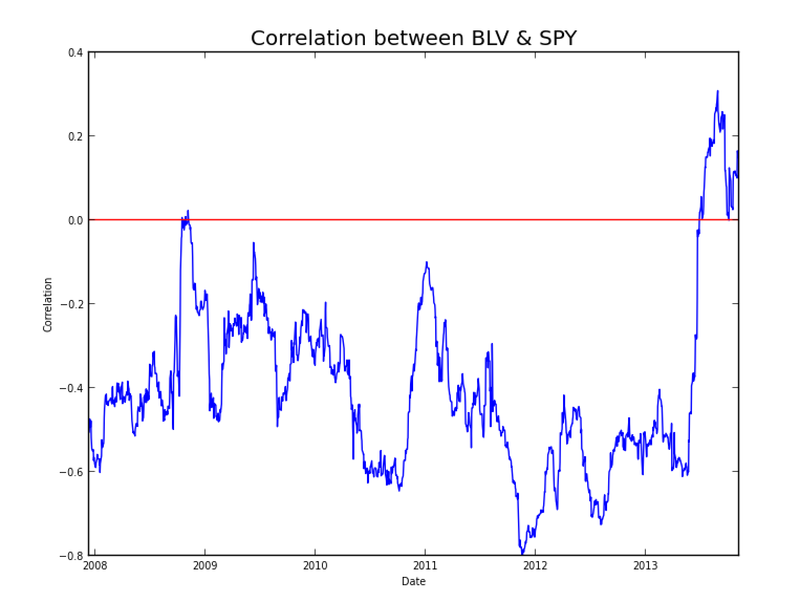 The correlation of daily returns of long term bond prices versus the S&P 500 (using BLV and SPY respectively). Why is this? There are two parts to the explanation: A quantitative explanation that addresses what we can observe in the markets, and a qualitative explanation regarding the underlying emotions of the people participating in the market. Let’s start with the quantitative explanation. As we discussed above, historically, bonds and stocks are anti-correlated. We have plotted this relationship in the chart at right. At each day we plot the trailing 42 day (2 month) correlation between stocks and bonds since 2008 (blue line). This value can range from -1.0 to +1.0 A negative value indicates that the assets were anti-correlated at the time. As you can see this value has been mostly negative (below the red line at 0.0). Our 50% BLV, 50% SPY portfolio from above. In this image we indicate the periods of high correlation in red. In May 2013 stock and bond prices dropped together and we transitioned from anti-correlation to a spike in correlation. We’ve been in positive correlation territory ever since May (as of October 2013). Take another look at our straw man asset allocation strategy (figure at right). This is a repeat of the earlier chart, but I’ve indicated periods of positive correlation in red. There have only been two times in the last 6 years when the correlation has been positive, and the performance of our straw man was sub-par at those times. The Bridgewater All Weather Fund, the granddaddy of risk parity funds, run by Ray Dalio: -5% in May, and -8% for the year. Stories in WSJ and Reuters. 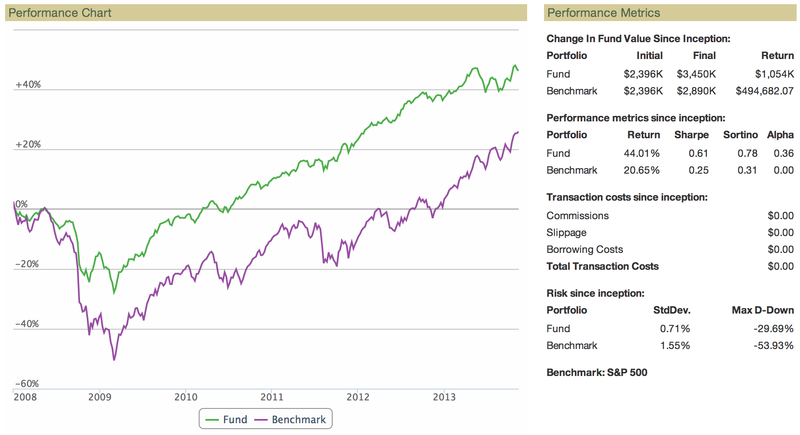 The Darwin asset allocation strategy run by Macquarie Private Wealth: -5% in May. The AQR Risk Parity MV fund: -3.5% in May and -9.0% in June. Overall -2.85% as of July 1. Their Risk Parity HV fund suffered similar losses and was -4.79% as of July 1. These funds are available as QRMIX and QRHIX. Cambria Global Tactical Fund (GTAA): -3.8% in May, -3.4% in June and +0.74% as of July 1. The StumpGrinder strategy I direct was also down in May and June, and down slightly as of July 1. Why were these strategies down? The All Weather Fund … uses a so-called “risk parity” strategy that is supposed to make money for investors if bonds or stocks sell off, though not simultaneously. It is a popular investment option for many pension funds and has been marketed by Bridgewater and Wall Street banks as way to hedge market turmoil. But money managers familiar with the strategy said it does not perform when both stock and bond prices tumble, as global markets have experienced in recent weeks. That article was referring to the Bridgewater strategy, but the rationale for the drop applies to all the funds listed above. Low bond interest rates force investors to look to stocks and risky fixed income assets for reasonable return. Low interest rates enable investors to borrow money to buy more stocks and risky bonds than they might buy otherwise. Higher interest rates on new bonds will trigger price drops on existing bonds. New bonds will become more attractive, spurring rotation out of stocks. As borrowing costs rise, investors will have to unwind (sell) their positions in stocks and risky fixed income positions. Last month (June) stocks plunged after Bernanke said the Fed could slow the bond purchases later this year and end them next year if the economy strengthens. Since them, Bernanke and other Fed members have stressed that any change in policy depends on improvement in the job market and economy, not a target date. That has helped push stocks to new highs. But we seem to be in transition now. The end of QE3 is concretely on the horizon. It seems that news (or even rumor) of Fed policy change will drive stock and bond prices more significantly than any other factor. Actual changes in policy are certainly ahead so we will see more market responses like the May/June dip in the future as they take effect. Expect this relationship t0 continue until the Fed halts QE3 and takes a first step to raise interest rates. After that we’ll return to a more traditional market regime. Until then expect volatility in bonds and stocks. Well managed asset allocation funds can still provide solid returns if their assets are chosen carefully. But as long as bond and stock returns are correlated their returns will be more volatile than usual. It is worthwhile now to consider other sorts of strategies for low vol / consistent return. In any case, even with the current volatility, for many investors asset allocation is still the best game in town. Asset allocation strategies have strong track records through many tough historical periods and I expect that record to continue. However, until the Fed’s policy changes concretely, fund managers will have to think carefully about the instruments they use. Here’s a plot of the current relationship with 63 period correlation (quarterly) showing price correlation and weekly return correlation. Looks like when we finally get both of these metrics below 0 you would want to restart your Sumpgrinder ETF rebalacing strategy.